As you’ve seen, this recent breakthrough in hydrogen power is changing the world. Major corporations like Apple, Amazon, Google, Facebook, and Walmart are already investing billions of dollars in the technology. With this in mind, it comes as no surprise that the market is heating up like never before. You might remember from my presentation that we’ve already seen several hydrogen stocks explode — some as high as 18,000%. This is one energy boom that you won’t want to sit out. It could be 50 years before the next one. That’s why I’ve pinpointed the single company that stands to grow the most from the explosion of this sector. 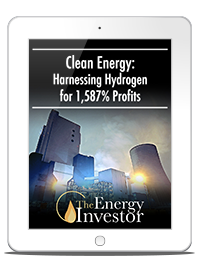 As I mentioned, the name of the company and it’s ticker symbol are included in my newest report, "Clean Energy: Harnessing Hydrogen for 1,587% Profits." The kinds of stock that people will be talking about in a few years, wishing that they'd bought it. Bonus Report No. 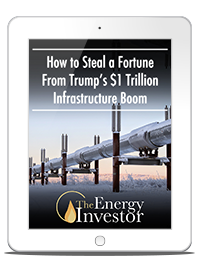 1: "How to Steal a Fortune From Trump's $1 Trillion Infrastructure Boom"
Even though we're gearing up to make a mountain of cash from the hydrogen boom, oil and gas won't disappear overnight. That’s why we won't be losing sight of President Donald Trump’s plan to invest $1 trillion in America’s crumbling infrastructure. And billions of those dollars will go to the development of new oil and gas pipelines over the next four years. The U.S. is in desperate need of more pipelines. America needs over $200 billion worth of new pipelines to accommodate our demand. And a lot of new money is about to flow into the system. And I’ve identified three companies that will be prime beneficiaries while Trump pushes these new deals through. One of these companies represents a way to play every single pipeline that’s currently under construction in North America. This firm researches and develops technology that improves the flow of pipelines overall. And in return, it collects a small amount of money from each project that it can get its hands on. Imagine getting paid every time a barrel of oil travels through a pipeline... That’s the kind of opportunity at stake here. In this special report, I show you exactly how to get in now. Bonus Report No. 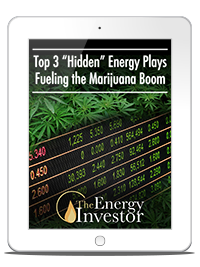 2: "Top 3 'Hidden' Energy Plays Fueling the Marijuana Boom." It’s expected to hit $21 billion in legal sales in the U.S. by 2020. That's not bad when you consider sales only hit $6.7 billion in 2016. Most people don’t realize that the booming marijuana industry is one of the nation’s most energy intensive. It often demands 24-hour indoor lighting rigs, heating, ventilation, and air-conditioning systems at multiplying growing sites. One of them is a tiny lighting company that growers are relying on more and more. In fact, it recently won the marijuana industry’s Best Lighting Company award. I'd like for you to have immediate access to this opportunity. So. I’m including this $79 report — absolutely free — with your no-risk trial. Instead of paying Energy Investor’s list price of $249, you’ll only pay $99 for a full year of access. That’s more than a 64% discount! 12 monthly issues of Energy Investor. Our issues are jam-packed with new and exciting research on the planet's hottest energy companies. Every month, I'll tell you about a breakthrough company that has the potential to make investors rich. You'll get the name of the company, its stock symbol, and specific instructions to help you in investing for maximum profits. Flash alerts. Every day, I watch the markets and keep a close eye on each of my recommendations. So, if something changes with any of our positions, you'll be the first to know via my flash alerts. Weekly curated content. Each week, I'll share the most important financial and energy news from around the web. This way, you'll stay up to date on all the latest breakthroughs and innovations, even before they hit the public market. Unlimited access to the private members-only website. Read all our back issues and reports. And stay up to date on all the cutting-edge energy opportunities that I uncover. World-class customer support. Whenever questions or problems arise, you can give the Energy Investor's support staff a call. You'll receive immediate live help, Monday through Friday between 9:30 a.m. and 4:30 p.m. (ET). You have nothing to lose. Reserve your space now to test-drive Energy Investor for six months without any obligation. If you’re not thrilled, for any reason, all you'll have to do is contact Angel Publishing’s support team. And you’ll receive a full and prompt refund. Even if you decide to cancel your subscription, you'll still get to keep everything. That includes the three special reports outlined above. So, subscribe risk-free to Energy Investor now. 2 Year: $179 - Great Deal! Special Report: "Endless Clean Energy: 1587% Profits from the Hydrogen Revolution"
Bonus Report #1: "Top 3 'Hidden' Energy Plays Fueling the Marijuana Boom." Bonus Report #2: "How to Steal a Fortune From Trump’s $1 Trillion Infrastructure Boom""
1-Year Auto-bill Subscription: $99 - Good Deal! Bonus Report #2: "How to Steal a Fortune From Trump’s $1 Trillion Infrastructure Boom"